A woman on board the subway train that derailed in Harlem Tuesday plans to sue the MTA and the New York City Transit Authority for $5 million, her attorneys say. Sheena Tucker, of Hamilton Heights, was on board the A train when it derailed outside the 125th Street station Tuesday morning, law firm Rubenstein & Rynecki says in a notice of claim filed Wednesday. Tucker's attorneys claim she suffered physical and psychological injuries, as well as emotional trauma in the derailment that forced hundreds of panicked riders to flee through darkened tunnels and crippled the transit system for the day. At least 34 people were treated for minor injuries, fire officials said. "I was being pushed, I was trampled, I passed out for a second, I was throwing up from the smoke," Tucker said at a news conference held with attorney Sanford Rubenstein Thursday. The subway derailment is the latest in a series of frustrating infrastructure issues, and now the new man in charge, MTA chair Joe Lhota, is taking tough questions about it. Andrew Siff reports. The MTA says it doesn't comment on pending litigation. 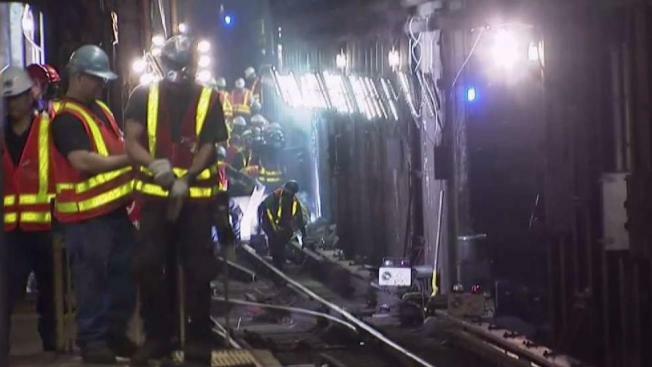 The notice of claim says the MTA and its subway agency, the NYC Transit Authority, were "careless," "reckless," and "negligent" in overseeing the subway, which Tucker's attorneys claim led to the crash and caused Tucker to be "seriously injured." The planned lawsuit will seek $5 million for "serious and severe personal injuries, the full extent of which are not currently known." 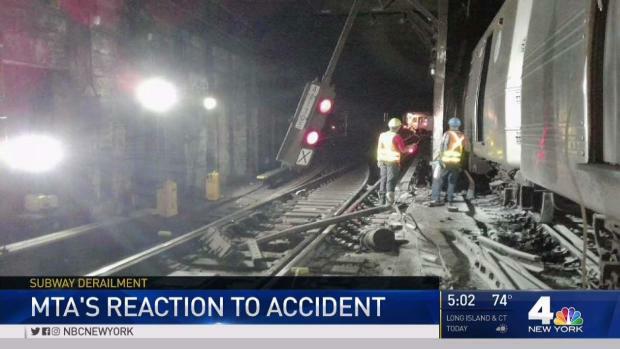 Meanwhile, two MTA supervisors were suspended Wednesday after MTA officials said the derailment outside the 125th Street station was caused by human error -- specifically an "improperly secured piece of replacement rail" that was stored on the tracks.